Airships, aliens and awesome things. Gamersgate has rolled out a new IndieFort bundle just in time to help Americans celebrate something about tea or Paul Revere or fighting off the British with nothing more than fireworks and grilled meats. It's a bit of a small bundle featuring only three games, but they all have co-op play, which counts double as far as we're concerned. Starting things off is Sanctum, the first person shooter/tower defense hybrid that hopefully needs no introduction. It offers four player online co-op that delicately walks the line between "shoot all the things" and "imma build a tower and watch it shoot all the things". Sanctum 2 was released just a few months ago, but it's quite a different game than the original, which we pointed out in our Sanctum 2 co-op review. Next up is AirBuccaneers, a multiplayer combat game where you and a crew fly an airship that does battle with other airships. Yes, it's as awesome as it sounds and yes, it's quite a bit like Guns of Icarus. The servers have been pretty dead these past few months, so hopefully this bundle will stir up some activity. Rounding out the list is Awesomenauts, a multiplayer online battle arena (MOBA) with a very strong co-op component. We even went to far as to review it! The IndieFort bundle has a set minimum price with the option to give a little more to the developers. After 6,000 sales, three bonuses will be unlocked, including two soundtracks and the Super Sanctum TD game. 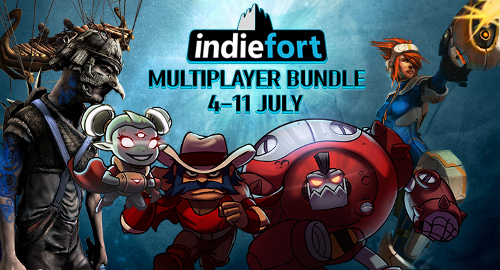 The IndieFort bundle is available now through July 11th. Page created in 0.5203 seconds.